Handy, a company that contracts with individuals to perform cleaning and maintenance work, has lobbied for rules that would limit its responsibility to provide worker’s compensation, and other employment benefits. Note: In a previous version of this story, our guest indicated that the Texas Workforce Commission was reviewing this rule in a meeting on Feb. 5. This was incorrect: the commission was not planning to review the rule at Tuesday’s meeting. An August Gallup poll found 36 percent of U.S. workers are involved in the gig economy in some capacity. If you or someone you know has done freelance work, made deliveries or given rides to strangers in your car, you know something about that, and you’ve probably used a smartphone app to arrange and manage those jobs. Uber, Lyft, Instacart and TaskRabbit are among the best-known gig companies. Recently, the Texas Workforce Commission tentatively approved a new rule that says people who find work through an app are ineligible for certain employment protections. This has raised alarm bells among labor advocates in the state. Justin Miller, a reporter for The Texas Observer, has recently been writing about the rule. “It’s not quite final,” Miller says. “It was initially passed in December after a few months of consideration. … It would essentially create a new classification of employees and employers — marketplace contractors.” This term would refer to people who are doing work through Instacart or Handy or other companies that hire workers through a platform to provide some sort of service. The Workforce Commission is identifying a new kind of worker. Marketplace contractors are exempted from a whole host of traditional protections for employees like minimum wage, overtime pay, unemployment insurance and worker’s compensation. The Texas Workforce Commission is tentatively considering a rule that would exempt these marketplace contractors from unemployment insurance coverage. This law provides legal protection to employers against lawsuits, which have been a growing trend in the battle over the future of the gig economy. “The Workforce Commission has not been super-clear about when exactly they’re going to finalize the rule. . . the commission has been relatively tight-lipped about where the impetus for this rule came from. . . [and] who was involved in advocating for its creation. It’ll be interesting to see what happens to see what tomorrow,” Miller says. 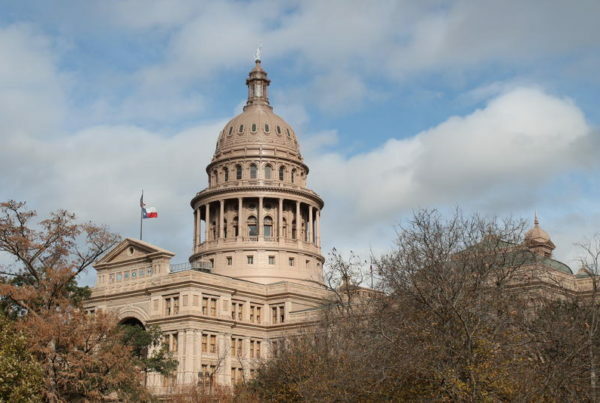 Will Unity Among The State’s ‘Big Three’ Last Beyond Greg Abbott’s State Of The State Address? This Austin Resident Was On Texas’ List Of Potential Illegal Voters. Now She’s Suing.